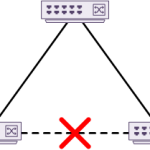 A VRF is either VPN Routing and Forwarding or Virtual Routing and Forwarding. It depends who you ask. What matters though, is what it does. Every layer-3 device has a routing table. The device uses the routing table to make routing decisions. But did you know that some devices have several routing tables? That’s what VRF’s are all about. Each VRF is an extra routing table. Generally, only routers support VRF’s, not all layer-3 devices. But why would you need several routing tables? 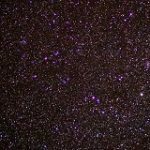 There are a few reasons, which will be revealed throughout this article. The most common is to many customers, while keeping them separate. Are you familiar with VLANs? 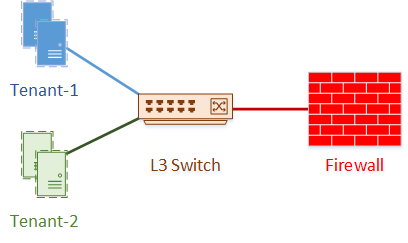 VLANs separate traffic on a switch at layer-2. VRF’s are similar, as they separate traffic on a router at layer-3. To help with understanding this, have a look at the diagram below. This is a single router with three VRF’s. Each VRF is a completely separate routing table. 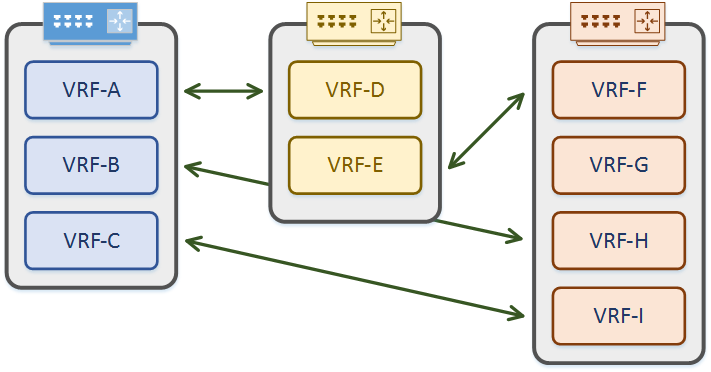 Routes in one VRF may overlap with routes in another VRF. This is not a problem at all, and can be quite useful. When creating extra VRF’s, the original routing table still exists. It is the default VRF, also known as the global routing table. So, how do routes get into a VRF? 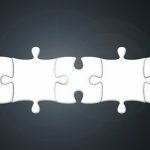 The first step is to understand how VRF’s and interfaces play together. Every interface on a router is in one VRF. That means that every interface is in a VRF. To start with, every interface is in the default VRF. As more VRFs are created, interfaces can be assigned to them. These interfaces may be physical, or virtual, such as a VLAN SVI or loopback. When an interface has an IP address assigned, that network appears in the VRF as a connected route. This is the same behaviour as in the global routing table. By default, networks in one VRF cannot communicate with networks in another VRF. Under some circumstances, this behaviour changes, but more on that later. So far, we’ve talked about VRF’s. But what about VRF-Lite? After all, that’s what this article is about right? Are they the same thing? Hmmm… Sort of. It’s a terminology thing. MPLS VPN deployments use VRF’s. This is often used by service providers so their customers can share the network. These deployments use BGP for routing, which is VRF aware. Other deployments will use VRF’s, but will not use MPLS and BGP. This is VRF-Lite. Often VRF-Lite deployments are called VRF’s, which is fine. This is a good time to emphasis that VRF’s are locally significant to each router. A VRF on one router does not need to match a VRF on another router. Remember that they are routing tables. It’s like having several virtual routers running at once. As shown below, interfaces from various VRF’s may connect to VRF’s from any other router. Names and configuration does not need to match in any way. All they need is suitable IP addressing. So what would you use VRF’s for? Good question! As already mentioned, one use is to separate customer traffic. This is particularly useful for service providers and modern multi-tenanted data centres. Another reason is because they allow IP spaces to overlap. Why would you ever design your network with overlapping IP address spaces? In a perfect world, you wouldn’t. But your company may merge with other companies that use the same space as you. If this happens, you could re-address the network, use NAT, or use VRF’s. The solution may be a combination of all three? Do you have guest WiFi? Or, public kiosk computers? 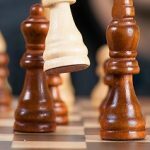 You will want to keep their traffic separate from your corporate network. VRF’s may be the solution you’re looking for. OK, time for one more. Imagine that you have virtual machines that connect to a layer-3 switch. These are in two Business Units. VM’s from one BU should not talk to VM’s from the other BU without passing through a firewall. In this case each BU could have a VRF. Each VRF could have a default route to a firewall. As traffic can’t pass between the VRF’s, it will have to go out through the firewall, and back in to the other VRF. This is an interesting scenario… Lets look deeper into that soon. First, a simple scenario. Look at the diagram below. There is a single physical Layer-3 switch, with VM’s attached. The VM’s belong to two different tenants, and their traffic should not mix. The default gateway for each VM is an SVI on the switch. This allows traffic to pass from one tenant to another, which is unacceptable. To resolve this, we need to create a VRF for each tenant. Each VRF will have an interface connecting to ISP routers. This is how the tenants will get internet access. For lab purposes, the ISP-1 and ISP-2 routers are already configured. They are not aware of VRF’s, so they only have the global routing table. Two loopback interfaces represent the two tenants. The VRF must exist before it can be used. In IOS, this includes specifying each address-family that the VRF supports. Other implementations, such as NXOS, do not need an address-family. This lab will only use the IPv4 address family. Every interface belongs to a single VRF. If an interface has no VRF specified, the interface belongs to the default VRF. Use the vrf forwarding command on the interface to associate an interface with the VRF. Here’s an important fact to remember. Any L3 config on an interface is removed when associating the interface with a VRF. So, remember to configure the VRF first, then the IP address. 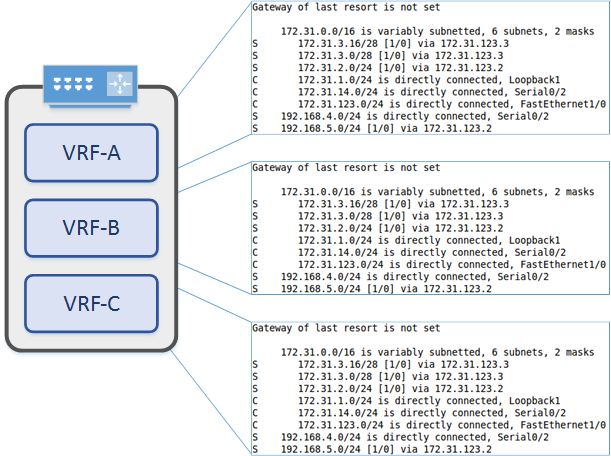 Static routes can also be associated with a VRF. For this lab, there are two default routes. That is, one default route for each tenant. Have a look at the routing table. The default VRF, AKA the global routing table, has no routes at all. 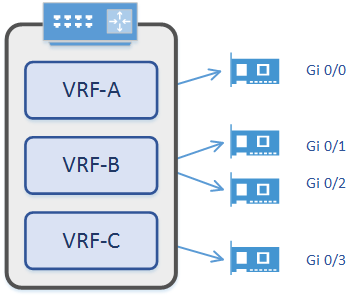 ISP-1 and ISP-2 VRF’s have the static routes, as well as local and connected routes. Below, the ping to 10.0.0.1 fails. This happens because the ping is using the default VRF. To use a different VRF, specify the VRF in the ping command. The ISP networks are reachable. Notice that tenants in the ISP-1 VRF cannot ping networks in the ISP-2 VRF. What if you want to run OSPF or EIGRP? Is this possible? Sure is! Let’s assume we want to run OSPF. There are two ways to approach this. Each VRF can run its own OSPF process. This provides the best traffic isolation, but there is a limited number of processes. The other way is to run OSPF as a single process. Each VRF is still isolated, but there’s a risk. Faults with the process would affect all VRF’s. For example, if you removed the OSPF process, routing would break for all VRF’s. What if you want to share routes? There are two ways to do this. One way is to use MP-BGP to leak routes from one VRF to another. This is an interesting topic, but is beyond the scope of this article. The other is with traffic hair-pinning. This is where an external router or bridge connects to both VRF’s. Let’s look at an example of that. This is going to build on the previous example. Let’s assume that it’s ok for tenant 1 to connect to tenant 2, as long as traffic passes through a firewall. In this case, the firewall can have an interface connected to each VRF on the switch. This might be two physical interfaces, or a single physical interface with sub-interfaces. The switch and firewall both run OSPF. The VM’s use the switch as their default gateway. Traffic from tenant-1 passes to the switch, then out of the VRF to the firewall. From the firewall, the traffic passes into tenant 2’s VRF on the switch, then to the appropriate VM. The firewall does not use VRF’s itself, and is preconfigured in this lab. To allow this to work, the IP of gigabit 0/2 is now 10.0.20.1. The static routes are also removed. Below, OSPF is configured on the L3 switch, which peers with the firewall. Routes for both tenants are now appearing in both VRF’s. The difference is that the next hop for other tenant networks is the firewall, which OSPF learns. 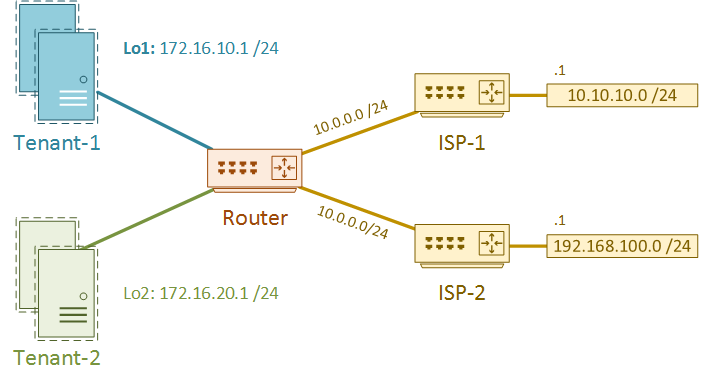 Ping and traceroute show that traffic between tenants is passing through the firewall. This allows the firewall to inspect the traffic, and apply security policies.